The concept of the social responsibility of business has roots in the Puritan doctrine of stewardship as well as the nineteenth-century "gospel of wealth," but business leaders only began to consider community welfare as a whole in the context of their corporate aspirations of the latter half of the twentieth century. Originally appearing in 1970, The Social Responsibilities of Business surveys the history of corporate actions in pursuit of social responsibility, and attempts to assess likely developments. 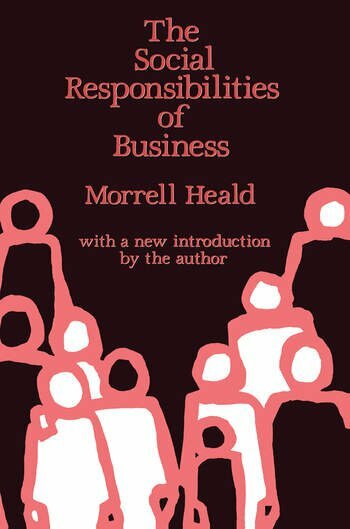 Reissued in 1988 by Transaction with a new introduction by the author and now available in paperback, the volume provides Morrell Heald the opportunity to evaluate his earlier predictions and identify prospects for further development in the area of corporate social responsibility. Some of Heald's predictions have not yet come to fruition, and he reflects upon the reasons. No effective structure yet exists to permit an open exchange of views and needs between business and representatives of its various constituencies. In addition, two of Heald's earlier suggestions have not taken root in the way he anticipated--the company foundation, and the corporate social audit--and he assesses why they have not, and what opportunities they still provide. The Social Responsibilities of Business provides essential background for understanding the developing social role of the corporation and for assessing its future direction.